Table salt, also known as sodium chloride, is a crystal (a symmetrical solid substance made entirely of the same material). You can see the shape of a salt crystal under a microscope, and you can grow your own salt crystals for fun or for a science fair. Growing salt crystals is fun and easy; the ingredients are right in your kitchen, the crystals are non-toxic, and no special equipment is required. It takes very little work to start the process of growing salt crystals, though you will need to wait a few hours or days to see the results, depending on the method you use. No matter which method you try, you'll need to use a hot stove and boiling water, so adult supervision is advised. Quick Crystals: If you want crystals quickly, you can soak a piece of cardboard in this supersaturated salt solution. Once it is soggy, place it on a plate or pan and set it in a warm and sunny location to dry out. Numerous small salt crystals will form. Perfect Crystals: If you are trying to form a larger, perfect cubic crystal, you will want to make a seed crystal. To grow a big crystal from a seed crystal, carefully pour the supersaturated salt solution into a clean container (so no undissolved salt gets in), allow the solution to cool, then hang the seed crystal in the solution from a pencil or knife placed across the top of the container. You could cover the container with a coffee filter if you like. Experiment with different types of table salt. Try iodized salt, un-iodized salt, sea salt, or even salt substitutes. Try using different types of water, such as tap water compared with distilled water. See if there is any difference in the appearance of the crystals. If you are trying for the 'perfect crystal' use un-iodized salt and distilled water. 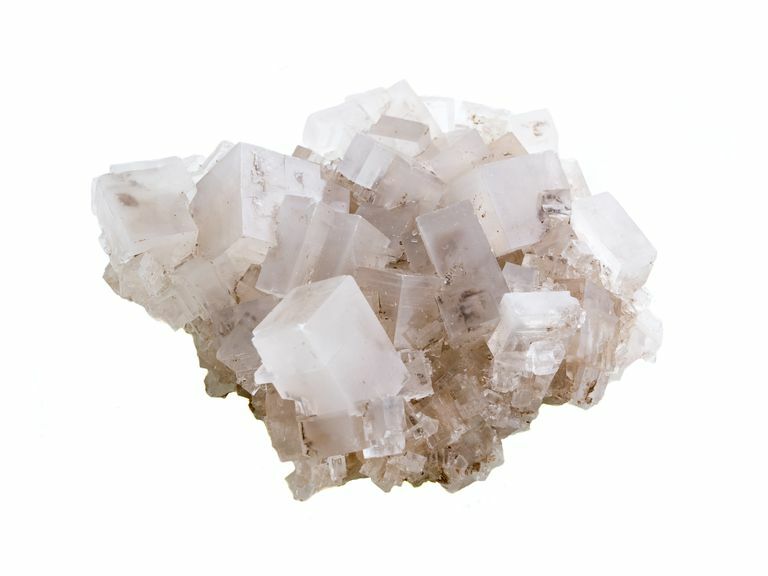 Impurities in either the salt or water can aid dislocation, where new crystals don't stack perfectly on top of previous crystals. The solubility of table salt (or any kind of salt) increases greatly with temperature. You'll get the quickest results if you start with a saturated saline solution, which means you want to dissolve salt in the hottest water available. One trick to increase the amount of salt you can dissolve is to microwave the salt solution. Stir in more salt until it stops dissolving and starts to accumulate at the bottom of the container. Use the clear liquid to grow your crystals. You can filter out the solids using a coffee filter or paper towel.